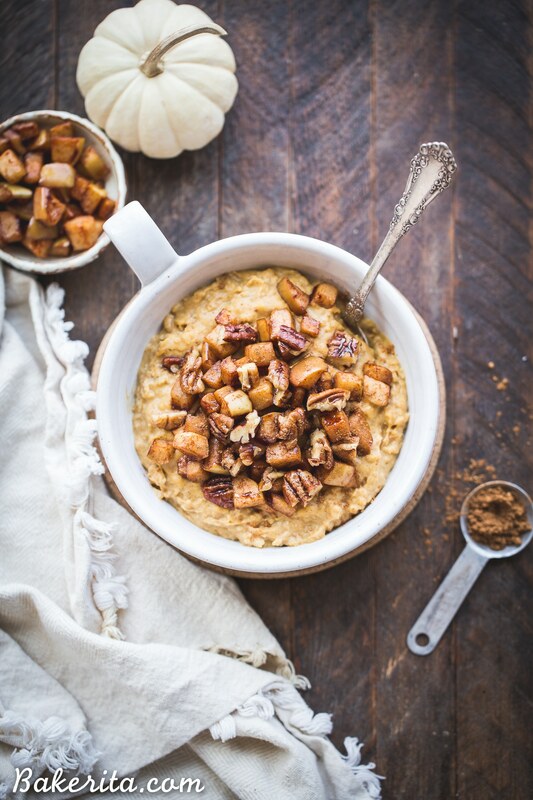 This Pumpkin Spice Oatmeal is rich, creamy, and perfect for chilly fall mornings. It’s lightly sweetened with maple syrup and topped with warm sauteed apples. It’s also gluten free and vegan. San Diego days have still been warm…summer kinds of warm. But in the mornings, we’ve been getting a hint of fall – chilly air and a little wind; just enough to warrant a sweater on my morning walks. By mid-day, we’re back to sunny and sweaty weather, but I’ve been cherishing these cooler mornings. They’re my “me” time – the time where I take a long walk with Hank, enjoy my mushroom coffee, do a meditation or go to yoga class, and then delve into one of my favorite parts of my work day: photographing. The cloudy mornings are my preferred time to take photos, since the clouds are a natural diffuser, giving photos beautifully soft & diffused light. 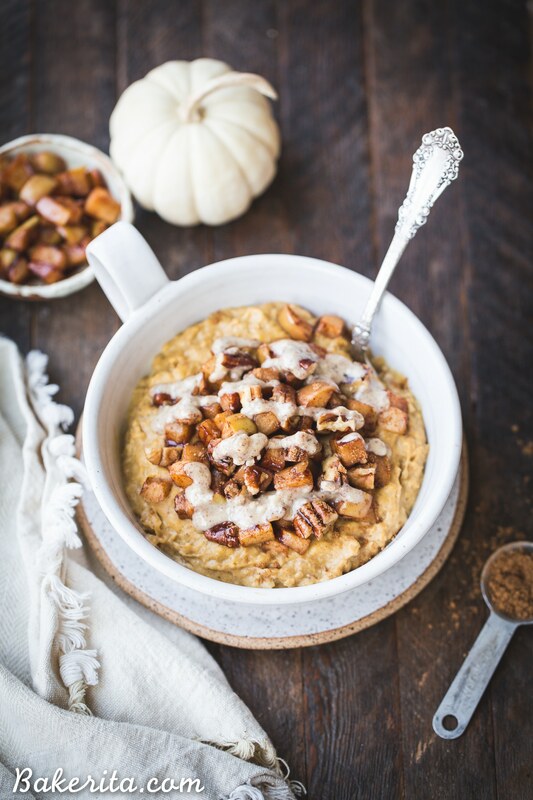 These cloudy mornings are also the perfect time for me to cozy up with a warm bowl of pumpkin spice oatmeal and pretend that it’s not going to get into the high 70s later that day. While I always go back to my go-to bowl of oats (these Chocolate Strawberry Oats, usually with a drizzle of peanut butter), I felt like a seasonal change of pace was needed, and this bowl of Pumpkin Spice Oatmeal with Sauteed Apples was born. They’re simple to make, as oatmeal always is, and made extra creamy from the pumpkin puree. They’re lightly sweetened with a bit of maple syrup and spiced with a few shakes of pumpkin pie spice. While the oats simmer on the stove, absorbing the almond milk, apples are sauteed in a little coconut oil and maple syrup until softened and a little caramelized. They too get a sprinkle of pumpkin spice, and then some chopped pecans are tossed in for a little extra crunch. 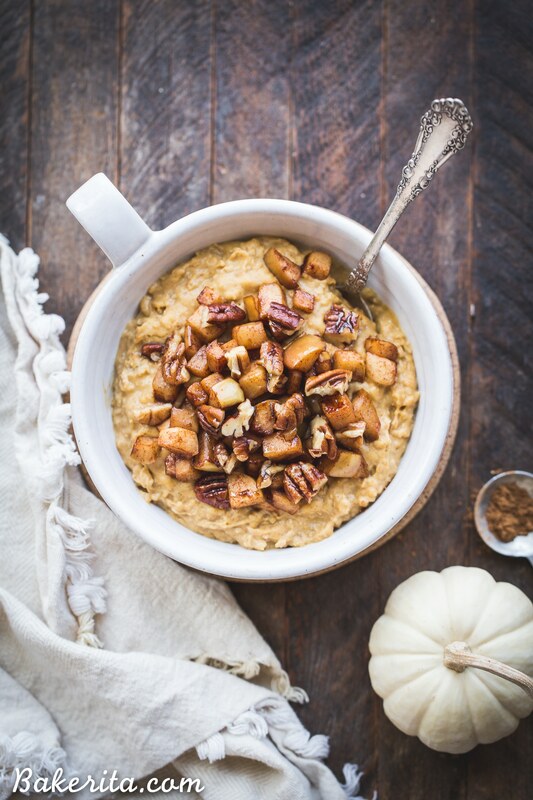 This Pumpkin Spice Oatmeal is perfect for chilly fall mornings. It's lightly sweetened with maple syrup and topped with warm sauteed apples. 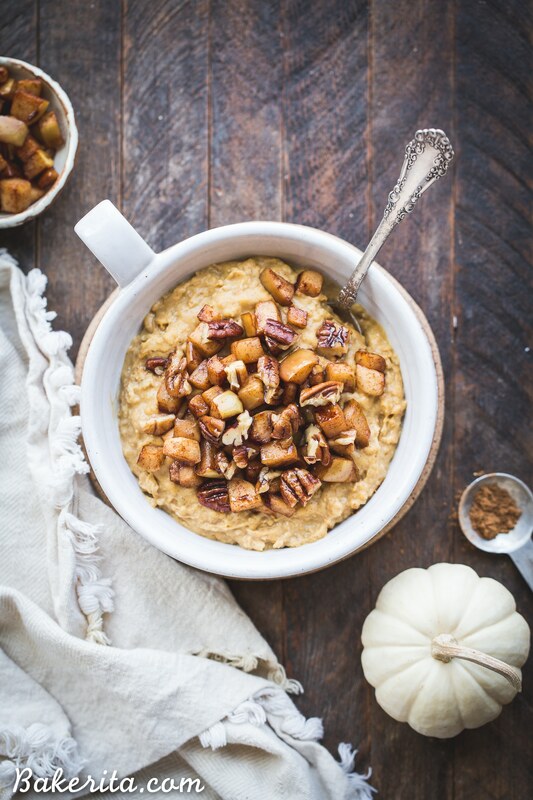 In a small saucepan, combine the pumpkin puree, rolled oats, almond milk, maple syrup, and pumpkin pie spice. Simmer until milk has absorbed into the oats, about 5-8 minutes, stirring occasionally. While the oats simmer, heat a small saute pan and melt the coconut oil. Add the diced apple pieces, maple syrup, and cinnamon. Saute until slightly softened, about 5 minutes. Toss in the chopped pecans. Place the oatmeal into a bowl and top with sauteed apples and if desired, a drizzle of nut butter (pecan butter is a great choice here). Enjoy immediately! Ok, so I’ve been eyeing your oatmeal recipes and wanted to try making one for so long now. When I received this recipe in my inbox yesterday I decided I had to try it this morning. As I write this I’m sitting here eating a bowl of deliciousness. Perfect for a sleepy Fall morning. It all came together very quickly. Thank you Rachel! As always, another home run! What is pumpkin purée? Is it fresh pumpkin cooked and then puréed or is it something canned used for pumpkin pie? I’m just a little confused. This recipe looks amazing. Hi Katrina, you can use either. If you want to make your own, it’s just roasted pumpkin that is then pureed, or you can take the simple route and use canned pumpkin puree (NOT canned pumpkin pie which has added sweeteners and spices), which is what I do. Hope this helps clarify!